There's two ways to look at this one. You could say that by adding our copyright details to our photo's we're protecting them from unauthorised use on the web, but to be honest, if some-one's going to "borrow" one of your photo's from Flickr, I don't think it's going to make much difference. 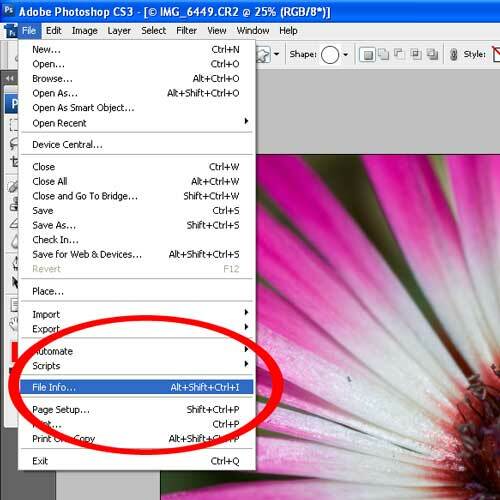 In these examples I'm going to be using Adobe Photoshop CS3 and Bridge. It might be slightly different in earlier / later versions, but you should get the general technique. Let's start with Photoshop. Simply work on your image, and before saving it, we'll add our info to the exif data that is embedded into the photograph. Now we can add specifics about this photo, perhaps title, description and keywords. Then we can save it, and that info will appear in Flickr when we upload it, or if we right-click "properties" and "advanced" in file browsers. 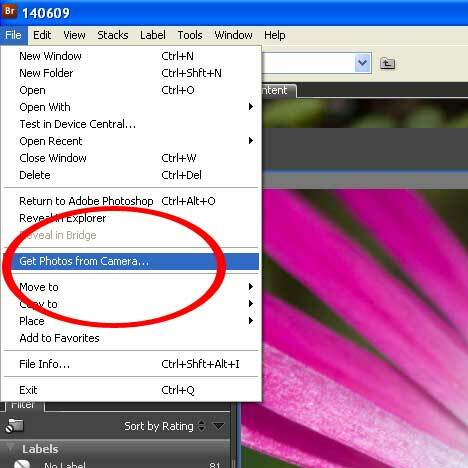 As you've seen, this is an easy and quick routine, but you do have to make sure you remember to do it for every photograph - wouldn't it be great if you could automatically add this info to your photo's as you copied them from your camera or card to your PC? Well, there is a way, and we do it with Adobe Bridge. You can use Bridge to add exif data to your images already on your PC, but I'm going to show you how to add it as you're copying your photo's to your computer. If you start to use Bridge to always import your photo's, this technique will become second nature, and you won't ever forget to add your contact and copyright information. 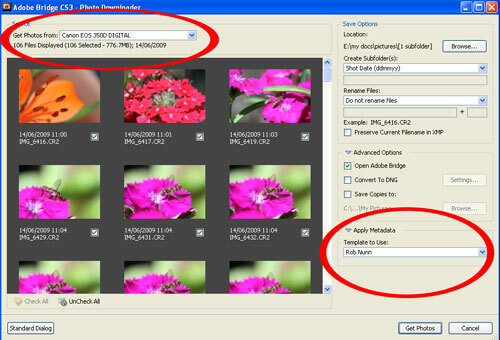 Now just click "Get Photo's" and Adobe Bridge will import your shots, adding your data as it copies them to your pc. Easy! So now, using this method, all of your imported images will have your basic copyright and contact details embedded into them. If you want a more exhaustive guide to Adobe Bridge, with details about how to add keywords to photo's, or batches of photo's, check out Epic Edits Complete Guide To Adobe Bridge. Thanks Rob, never tried to import photos using Bridge, and it's only recently, I think one of your podcasts, that made me think about adding my details to every photo. Good Article! Give Bridge a go - I think its great, and I haven't even begun to scratch the surface of this great app!